Because of the war and mismanagement of the economy, the salary debt to the Ukrainians by July 2018 reached the level, at which it had been 16 years ago – in 2002. According to the results of the first half of the year, Ukrainians must be paid already UAH 2.7 billion. While 355 million is what has been accumulated for six months of 2018. June was especially negative, during which the debt increased immediately by 6%. This is a problem not only for citizens who do not receive what they earned; it is the problem of the entire state. The debt is growing, first of all, to employees of strategic industries. Thus, debts to employees of the coal industry for the first half of 2018 increased by 26.2%, energy and gas supply – by 74%, machine building – by 23.9%. In general, industry debt increased by 18.5%. The debts to the Ukrainians grew in most regions of the country – in 20 out of 25. But in some of them the dynamics of unpaid wages has become threatening in nature. 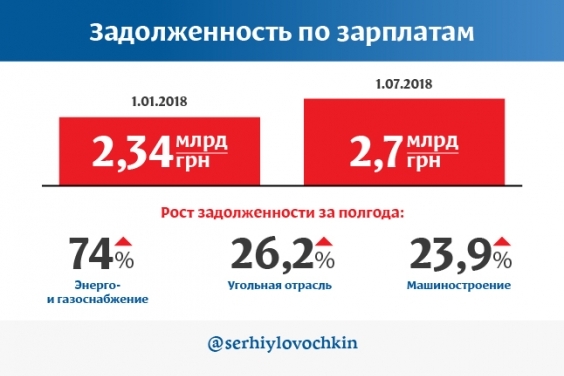 In the Zaporizhzhia region in the first half of 2018, debts increased by almost 2.2 times (or UAH 148 million), in the Sumy region – by 73% (or UAH 86 million), in the Kherson region – by 71%, in the Chernihiv region – by 75%, in the Ternopil region – by 95%. The policy of the authorities to reduce debt is ineffective. The requests to the government on this topic, submitted by me, remain without answers in fact. Our political force – the Opposition Bloc – is already taking efforts to address the problem of non-payment. Under the pressure of the Opposition Bloc on the last day of the voting at the end of the session of the Verkhovna Rada, a law on financial support of the coal industry was adopted, which would allow paying salaries to miners. However, without systemic work in the whole country, the problem cannot be addressed – it is not just statistical data. The debt leads to the fact that enterprises of strategic industries are losing the best employees – those who can be in demand in other places will not wait for salaries for years. As a result, chronic debt becomes one of the reasons for the migration of skilled and efficient citizens. The Opposition Bloc repeatedly made proposals to the Verkhovna Rada to create incentives for enterprises that would allow earning money, as well as sending it to repay debts to employees. We submitted even more proposals on the development of the economy, so as not to create debt in the future. Unfortunately, the authorities ignored them. In the end, to address the problem, we need one thing – a power that can address it. It is necessary a power, which realizes that people should get their hard-earned salaries on time, rather than encourage its citizens to leave for work. We should create conditions for the development of our country and an opportunity for a decent future for every Ukrainian.